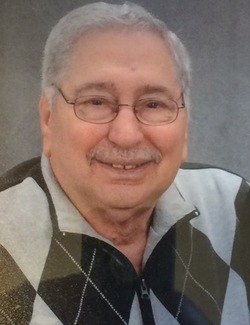 Ronald A. Mosic, 76, of Columbus, Ohio passed away peacefully August 12, 2015 at the James Cancer Center surrounded by his family. Born February 21, 1939, the son of the late John Q. and Mary L. (Capocciama) Mosic , Ron was raised in the south end of Columbus, attended St. Leo and graduated from Central High School in 1957 where he went on to attend The Ohio State University. US Army National Guard 1957-59. Retired from the Kroger Company after more than 40 years of service. Former Grand Knight in the Knights of Columbus Marian Council 3864. Inspired by his faith Ron was a long time volunteer St Vincent DePaul food pantry at St James the Less Parish and other various parish and school activities. Ron enjoyed playing golf, cards and taking trips with many close friends. His biggest joys in life included cooking Sunday dinners and spending time with his family, especially his grandchildren. Survived by his loving wife Mary Barbara (Schneider) of 51 years, children Stephen "Skip" (Angela), Cheryl (Chris) McKenzie and Barbara (Dan) Sanderell and grandchildren Emily and Anthony Mosic and Theresa, Joseph and Nicholas Sanderell as well as many aunts, uncles, nieces, nephews, cousins, in-laws and close friends. Friends and family received Sunday August 16th from 2-5pm, Rosary at 5pm at the MAEDER-QUINT-TIBERI FUNERAL HOME, 1068 S. HIGH ST., COLUMBUS, OH 43206, 614-444-1185. Mass of Christian burial 10am Monday August 17th at St. Paul the Apostle Church, 313 N. State St., Westerville, OH 43082, Father David Gwinner celebrant. A brief showing Monday morning at St. Paul Church beginning at 9:30am prior to the funeral Mass. Burial St. Joseph Cemetery. In lieu of flowers, contributions can be made to either the Musella Foundation for Brain Tumor Research (www.virtualtrials.com/mosic) or the St. Vincent DePaul Society. When you make the donation below, we will already know it is In Memory of Ronald Mosic and we will send an acknowledgement of your gift to the family.